Yoga — Pura Vida Travel Co.
Also known as the yoga capital of the country, Nosara is the ideal destination for yoga travel in Costa Rica. With stretches of unspoiled coastline, inspiring sunsets, and a community oriented towards holistic health and well-being, Nosara welcomes yogis of all walks of life to its magical shores. Nosara is home to a number of ecolodges and hotels specializing in yoga travel, while activities and local cuisine celebrate our connection to the natural world around us. Whether you're looking to join one of many retreats offered throughout the year in Nosara or design your own personal escape, we have the resources from local yoga and surf instructors to activities and tours to create the perfect itinerary for you or your group. Day 1 - Arrive at the airport in Liberia where private transport will be waiting to take you to your hotel in Nosara. Meet the rest group for sunset yoga and welcome dinner. Namaste. Day 2 - Wake to the sounds of the rainforest and greet the sun with a yoga lesson in the hotel's rainforest deck over looking the scenic coast. Take a surf lesson from local instructors before a healthy lunch and an afternoon on the beautiful Giones beach. Sunset horseback riding before dinner. Day 3 - Enjoy breakfast of fresh fruit and granola followed by stand up paddle board yoga on the Pacific Ocean. Sit in on a morning wellness workshop and cooking lesson before afternoon meditation and mangrove kayaking. Day 4 - Visit a local school in the morning to deliver donated supplies to students. Take the afternoon to explore before traveling to Ostional Beach around sunset to observe nesting sea turtles. Day 5 - The day is yours to enjoy at your leisure in and around the hotel, at the beach, or on a rainforest hike. Relax with massage and spa treatment before joining the group for a farewell dinner and beach bonfire under the stars on your final night in paradise. Day 6 - Depart for Liberia International Airport in time for your flight home. This trip is fully customizable to fit the needs of you and your group. Contact us today to add your personal touch to your next escape! Located on along the southern tip of the Nicoya Penninsula, Santa Teresa is a laid back town with chill out vibes providing the perfect setting for your yoga escape. Relax your mind and set your conscience free with yoga sessions in an open air pavilion, lush tropical garden, or on the soft sands of the beach. Challenge yourself with a surf lesson, experience the thrill of canopy zip lining or connect with nature through activities highlighting the unspoiled landscape and diversity of wildlife in the region. However you choose to spend time, Santa Teresa offers peace and serenity off the beaten path with luxury accommodations, invigorating spa services, and farm to table meals that will leave you in yoga bliss. 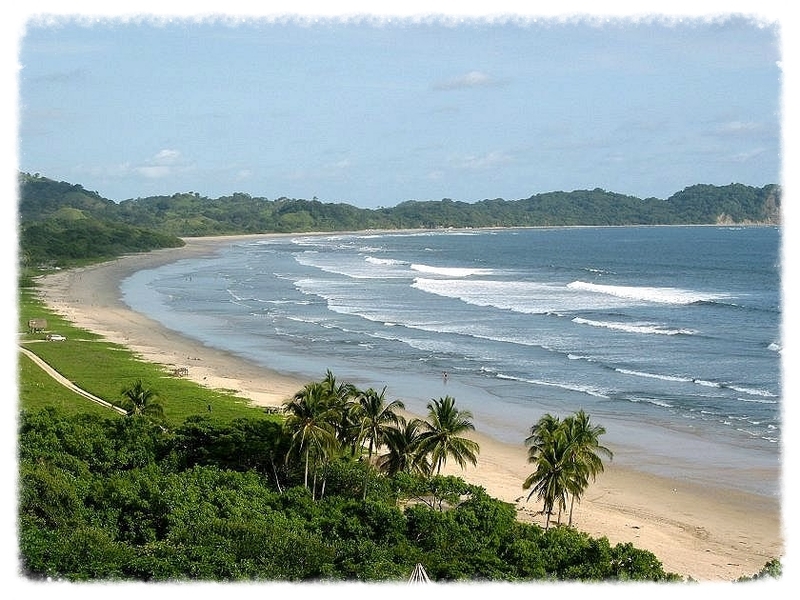 Day 1 - Arrive at the international airport in Liberia by midday for a scenic ride through the province of Guanacaste, heading south along the coast of the Nicoya Peninsula before reaching your final destination in Santa Teresa. Check into your beachside bungalow, make introductions with fellow travelers before late afternoon yoga and welcome dinner. Day 2 - Breakfast of yogurt, granola, and fresh tropical fruits is followed by yoga in the open air pavilion to start your day. Head to the beach for a morning surf lesson taught by some the best instructors in the region. Recover from the mornings activity with a massage after lunch. Wellness workshop before dinner. Evening meditation. Day 3 - Awake to the sounds of sea just outside your window and join the group for yoga on the beach before breakfast. Afterwards travel by boat to Isla Tortuga for a day of snorkeling, swimming, and beach barbecue on the shores of this picturesque island. Sunset yoga back at the lodge followed by another spectacular organic creation from the kitchen to end the day. Day 4 - Center yourself and find balance just beyond the breaks of the Pacific with stand up paddle board yoga in the morning. After lunch embark on a guided hike through Cabo Blanco Nature Reserve. The tropical dry forest is home to three species of monkey, anteaters, coatis, sloths, as well as numerous species of birds, reptiles, and plants all available to discover and observe throughout this unique ecosystem. Return to the hotel in time for a massage or spa treatment before dinner with the group. Day 5 - After breakfast and yoga in the pavilion participate in a beach cleanup in an effort to reduce your carbon footprint. The remainder of the day is free to explore the natural wonders of Santa Teresa. Experience the magnificent landscape with a horseback riding tour, rent a surfboard or stand up paddle board, or take your favorite book and settle into a hammock between two lazy palms. After dinner join the group for a farewell bonfire on the beach before bed. Day 6 - Depart in the early morning for Liberia International Airport arriving in plenty of time for your departure flight home. Osa Peninsula is nature at its best. With hidden jungle waterfalls, endless stretches of rainforest backed beach, and more biodiversity than seemingly possible for its relatively small size, it is truly a modern day garden of Eden. A place where jaguars still roam the rainforest, humpback whales leap from the waters offshore, and scarlet macaws gather in groups of twenty or more, Osa offers a unique connection to nature rivaled only by the Galapagos and Amazon in the western hemisphere. Unlike the aforementioned, Osa Peninsula remains off the radar for global travelers preserving its 'undiscovered' aura as well as a precious natural resources in this delicate ecosystem. As your eyes are opened and your mind expands to new and novel offerings from nature, Osa suddenly becomes a medium for self-discover as we leave distractions behind and focus on that which is before us. Day 1 - Arrive in San Jose, Costa Rica's capital and hop on a short domestic flight to Osa. Private transportation takes you to your hotel nestled along the southwestern shores of the the peninsula between the Gulfo Dulce and Corcovado National Park. Greet fellow guests and gather for yoga at sunset before dinner. Day 2 - Start your day off right with a fresh farm to table breakfast followed by yoga on the beach. Enjoy a surf lesson from local instructors with the rest of the morning free to swim, relax, or meditate on the beautiful beaches of Matapalo. Afternoon tour of an organic chocolate farm followed by spa treatment or massage to relax and unwind. Day 3 - Feel the presence of nature with up close encounters with monkeys, anteaters, sloths, and numerous species of tropical birds on a guided rainforest hike. Enjoy lunch and meditation alongside a refreshing jungle waterfall under the cool rainforest canopy before returning to the lodge. Participate in a wellness workshop and group discussion before dinner. Day 4 - Rise with the sun and head to the beach for stand up paddle board yoga. Afterwards visit a local school to donate supplies and learn about the importance of conservation based education in the region. In the afternoon explore the ocean, rivers and mangroves of Osa by kayak. Glide alongside mighty kingfisher, sun bathing turtles, and curious cayman as the sun sets on anther day in paradise. Day 5 - The day is free to enjoy at your leisure lounging on the beach or hiking the trails around the lodge. Further indulge in Osa with one of many optional activities including canopy zip lining, horseback riding, or a day trip into the heart of Corcovado National Park. Regroup at the end of the day for sunset yoga, farewell dinner, and beach bonfire. Day 6 - Final goodbyes and early morning departure for Puerto Jimenez and transfer to San Jose in time for your flight home. * Tours and activities including Chichicastenango market visit, Atitlán boat & village tour. Nestled in the western highlands of Guatemala Lake Atitlán lies in wait for travelers seeking her tranquil waters, magical shores, and impressive volcanic landscape under painted skies of blue, red, and gold. A gateway to the world of the Maya, Atitlán has become a popular destination for yogis seeking clarity, inspiration, and enlightenment. Breathing life into Atitlán, the shores of lake are rich in indigenous culture both past and present with the colors, cuisine, and faces of the Maya people, while the mountains surrounding harbor lush tropical vegetation and diverse wildlife. Immerse yourself in this mystic world as you embark on a journey of self-discovery. Lead by the Maya and their connection to this scared land, we seek to harness the energy of Atitlán described as life-changing, empowering, and purifying by those who have gone before us. Day 1 - Arrive in Guatemala City before transfer to the town of Panajachel. Cross the awe inspiring lake en route to your lodge blending into the natural landscape of Atitlan's shores. Settle into your room, greet fellow members of the group, and participate in sunset yoga overlooking the lake before dinner. Day 2 - Begin your day with a traditional breakfast prepared with ingredients from the local landscape. Expand the mind and prepare your body for the day with yoga in one of the temples on the hotel grounds. Afterwards head to Chichicastenango for an unforgettable open air market experience in this traditional Maya town. Return to the hotel for a swim in the magical waters of Lake Atitlán before evening yoga and dinner with the group. Day 3 - Awake to the sounds of nature on the lake, the songs of tropical birds lead you to yoga with the group and another healthy vegetarian breakfast. Celebrate and find inspiration in the ancient Maya culture preserved in the people of Santiago, Santa Catarina, and San Antonio on a guided boat tour of Lake Atitlán and its surrounding villages. Your afternoon is free to enjoy optional activities in and around the lake, including kayaking, horseback riding, and birdwatching before dinner. Day 4 - After breakfast gather for a guided meditation freeing your mind of distractions and worries while focusing on peace and serenity. Continue on your path of healing and rejuvenation with a spa treatment before lunch. Take the afternoon to rest and relax, take in a good book, or spend additional time in self-reflection with spectacular views of the lake and its mighty volcanoes. Day 5 - Take time out to visit a local school and deliver donated supplies in the morning. Return to the hotel for lunch and a lesson in the healing power of local medicinal plants. After dinner experience a traditional fire protection ceremony lead by a local Maya priest. Day 6 - Early morning transport to Guatemala City for your departure flight home.